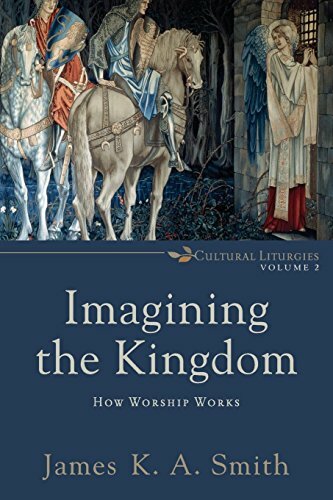 When our faculty book group began reading James K. A. Smith's new book Imagining the Kingdom: How Worship Works (hereafter ITK), one of us was suffering from "benign positional vertigo"—a mild wooziness punctuated by dizzy spells. This condition meant experiencing something like waking up in an unfamiliar environment, with the disorientation that remains until one's senses and thoughts collaborate to make sense of that strange context. Such sensations of being off-center, of the brain's interface with the surrounding world being disjointed, brought poignancy to our reading of Smith's argument. Smith claims that our cognitions presuppose a corporeal understanding of the world around us—"visceral plausibility structure[s]"—constructed by the narratives of our lives. We find Smith's argument largely persuasive and helpful. His claims, however, also prompt questions about the accuracy of his anthropology, the nature of "worship" (as broadly defined by Smith), the relationship between the Church and Christian colleges, and implications for such educational communities. Smith published Desiring the Kingdom: Worship, Worldview, and Cultural Formation (DTK) in 2009. In February of this year, he followed up with ITK, the second volume of the planned trilogy Cultural Liturgies. Together, these volumes pursue the ambitious goal of renewing "Christian practice," by which Smith means mainly what happens in Christian churches and colleges. The core claim is that effective worship and education must be based on correct anthropology, on a clear understanding of how human beings really act, know, and learn. Much is at stake in our account of human nature and of the relation of human beings to God. If the anthropology is right, then our ecclesial and pedagogical practices have at least a chance of being effective. But if the anthropology is wrong (i.e., if we have missed what drives human beings as human), then our policies and plans will be wrongly oriented. At best, our efforts may be effective only by a fluke; at worst, they will be effective in precisely the wrong ways, and our attempts to nurture and improve Christian worship and education will be misguided. Part 1 of ITK is devoted to Smith's channeling of "two key theorists of embodied intentionality," Maurice Merleau-Ponty and Pierre Bourdieu. Merleau-Ponty describes human being-in-the-world (including knowing, intending, and acting) as irreducibly embodied. To be a Christian, for example, is not simply to apprehend certain doctrines intellectually but also for one's imagination—what Smith calls praktognosia or practical knowledge (a bodily, non-discursive, pre-reflective orientation)—to be shaped and active in certain ways. Bourdieu focuses on communal practices (non-propositional, socialized actions, rituals, and inclinations)—instantiations of what Smith calls habitus—which determine more deeply and consistently than any theoretical cognition how human beings relate, decide, desire, and worship. Learning, then, is more fundamentally a matter of becoming proficient in such practices than it is becoming conscious of concepts and propositions. Smith's extended homage to these French theorists—somewhat repetitious, but written accessibly and with verve—serves his exposition of the anthropological "inner logic" of Christian churches' and schools' formation of believers. Christian formation is missional; its end is for Christians to be sent into the world. Smith therefore claims to be opposed to a hierarchical dualism of mind and body that prioritizes intellectual, reflective, discursive cognition over practical, affective, aesthetic involvement. For this very reason it is odd to see repeatedly this very dualism, inverted but reinstated: e.g., the "intentionality that precedes knowledge and whose locus is the body"; the bodily "exercises in constitution that did not engage my ratiocinative capacities for a second"; and the assertion that "our bodies make and respond to the world … in ways that are independent of representations or deliberative processing." There are two puzzles in such patterns. One concerns the confidence with which Smith can insist that the affective, embodied aspect of human life is prior to, and independent of, the cognitive and deliberative. Are the dimensions of human thought and action really so neatly distinguished and ordered? The other puzzle (highlighted by our colleague David A. Vander Laan) has to do with Smith's reluctance to acknowledge the embodied nature of the intellect itself. Deliberation, reflection, and consciousness—the stuff of which propositions, cognition, and worldviews are made—do not appear in a disembodied domain of abstraction. They happen in (even if they cannot be simply reduced to!) neurons and nerves, gyri and sulci, surrounded and supplied by glia, blood, and bone. Reading, writing, and arguing are communal, material practices. Rationality, too, is inescapably and irreducibly embodied and social. We agree that non-conscious perceptions and dispositions are deeply embedded in the texture of human being-in-the-world. But a simplistic reversal of the Cartesian mind-over-matter hierarchy is at cross-purposes with the careful anthropology and the pedagogical and liturgical seriousness for which Smith rightly calls.